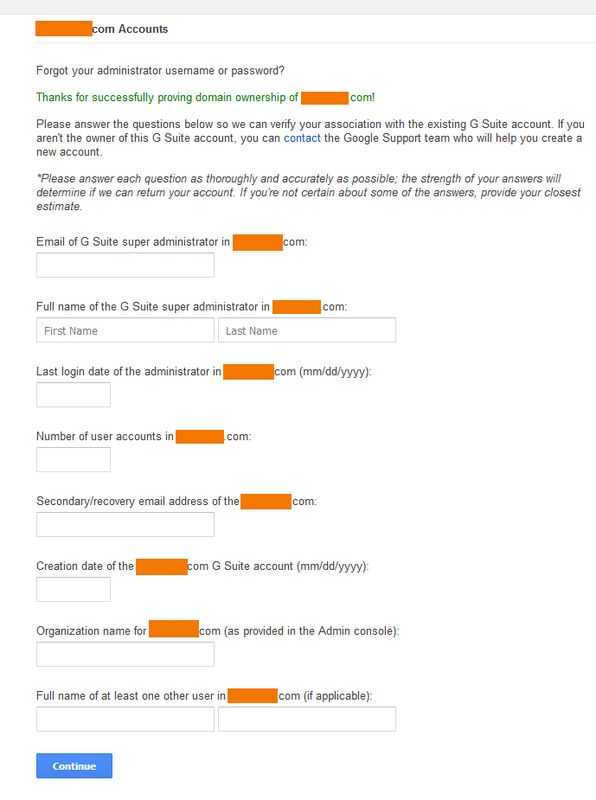 Assume you opened a Google Apps account and then somehow lost the password to the administrator email to that account. And perchance, you dont have that telephone number you used to have when you registered. You would go and reset your password just like any other internet service as we are accustomed to, using recovery emails, secret questions, account details, right? You are in for a magical roundabout of dead ends, circular redirections, fruitless identity-proving which total to no less then getting your teeth pulled or receiving a good kick in the balls. You go in there, click “forgot my password”, then after marking ‘I dont have my phone’ (that phone), you are asked to prove you own the domain by putting a CNAME record in yoru DNS. That is as advanced as it gets for majority of users. But ok, it so happens that you are an advanced user, a techie even, and you just drop the record in your DNS in 5 minutes and its live. Google checks it. Then it tells you that they will send an email to another email address to complete verification. You enter an email, which has to be outside that domain, apparently. And wait to receive the instructions. You do. And what you receive is a link to a ‘Knowledge Test’, which is a spectacular web form with fantastic questions. Unless you are at the age in which you remember small things in detail like “When i was in Sicily back in 1919…” as the famous Golden Girl so frequently remember, there is fat chance you remember date of creation of your account, and high chance in hell the date you last logged in. When you submit this web form, which poses as a support vehicle or a recovery option for a premium paid service, you are told to expect an answer in 72 hours, in which they may decide to give you back your account, which is created for the domain you own… Even the response time estimate, as anyone who dealt with Google support knows, is a very optimistic estimate. Now, note this: There is no option for an email recovery with alternate email you may have saved when logging in. Anyway there you are, owning your very own domain, and possibly even having access to all emails on that domain since you may have redirected MX records to another provider than Google, but your best option for recovering an existing old G Suite account is going through a teeth-pulling procedure. Whereas the account you created with your domain resides inaccessible. After 3-4 days, Google did contact me, confirming the request for domain deletion. They also told me that they have to first make sure that the earlier owner of the account/domain was not around, and they had to contact them to confirm that. And if they didn’t respond in 3 days, then they would delete the domain and give it back to me. Who do you think they contacted the next day as the ‘previous account/domain owner’ to confirm? So evidently, my personal email, which never appeared anywhere to be used for account recovery, appeared as a communication channel to the previous account/email owner and they used that email to follow their procedure. If that email was linked to that account in a reliable way to allow Google to know that email is linked to previous account owner, why not allow it to be used as a recovery email and save all that hassle in the first place? In any case, I told them that i was the previous and future owner of that account/domain, and asked them to either delete the account or give it back to me. They told me that they had to delete it and it would take ~3 days. After 3 days they contacted me again, telling me that now I could re-create an account with that domain. After that, I was able to recreate an account and start using Google Suite again, with the same domain name. The only thing that redeemed Google in this case was the quality of support – Even though the procedure was flawed, the quality of support was flawless at least.